precision mechanical timekeeping. Chelsea’s master clock makers have brought to bear decades of collective experience to craft this truly rare piece. Based on the design of an authentic yacht wheel, the piece boasts a number of exquisite qualities that are unparalleled in beauty and artistry. Key among them is the handfinished brass case and wheel handles. 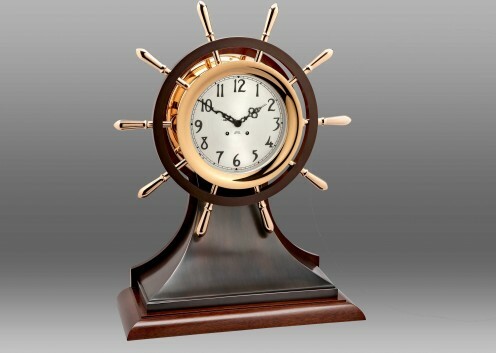 In contrast, the clock’s wheel and base are fashioned from rich, dark bronze brass. ensure accuracy in time and endurance in quality.